The latest 2019 exclusive Urban contemporary furniture collections are now at Harvest Moon including the Bombay Blue leather, Cara, Chelsea, Shard High Gloss, Henley, Japanese Minimalist, HI-TECH CHROME, Milan mirrored, Perspex, Waldorf Squares and Campaign collections plus contemporary sofas, contemporary armchairs and easy chairs, contemporary dining furniture, occasional tables, drinks trolleys, mirrors, trunks and trunk style furniture. The stunning ranges also include contemporary home accessories, lighting, rugs and wall clocks. All very modern, cutting edge in contemporary furniture pieces, bringing excitement and verve to every room you furnish, in a loft, flat, a town house, bijou apartment or a country mansion! Bring it on! The very latest addition to our contemporary collections. The Bombay Blue furniture collection is a contemporary blue leather / steel living room collection which includes a large cabinet, a large TV cabinet for all your home entertainment equipment, a coffee table with drawers, a 3 drawer chest, a set of 2 blue leather trunks on a steel base, a mini bar cabinet, a wall mirror, a pouffe and a fun chunky blue leather doorstop. FREE delivery! Click on the image or the link above to view the Bombay Blue range. The Bronx oak furniture collection is a fabulous collection of SOLID oak furniture at prices you used to pay for pine! 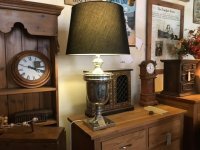 Over 60 pieces of contemporary oak furniture for the bedroom, dining room, kitchen and living room including dining tables and a selection of home entertainment furniture and probably our favourite piece - a solid oak 4 poster bed. Click on the image or the link above to view our Bronx furniture range. The Campaign furniture collection is a contemporary update on a classic, made from waxed Cape Lilac finished with brass edgings and handles. The collection is loosely inspired by the Nauticalia style, the stunning waxed finish empasises the natural grain in the wood giving each piece a rich high quality, sophisticated appearance. Click on the image or link above to see the Campaign range. The Urban Cara furniture collection is a contemporary twist on a Art Deco style with 3 oak / brushed gold effect stainless steel pieces with a stunning starburst patterned front - a cabinet, a sideboard and a media cabinet. The Cara collection also includes a range of brushed gold effect stainlesss steel framed occasional tables and a dining table with different coloured concrete tops. Ochre and copper upholstered living room seating also available to complement the Cara range. FREE delivery! Click on the image or the link above to view the Cara range. The Chelsea is a collection of black, white and gold contemporary solid wood living room furniture with sleek modern lines, chrome handles and chrome edging. Lots of pieces of contemporary furniture including wall display units, display cabinets, dining tables, a chest, a 7 tier wine rack, a mirror and a wide range of occasional tables including coffee, console, side, tray, display and tripod tables and desks. Ideal pieces for a hotel lobby, restaurant, jewellers or any other stylish retail establishment or a modern home. FREE delivery! Click on the image or the link above to view the Chelsea range. The Henley is a collection of Urban contemporary / retro 1950s style walnut veneer furniture with metal legs and detailing and the Camden is a darker retro 1960s London style charcoal painted veneer furniture collection with brass legs and detailing. The Henley and Camden furniture collections of bedroom, dining and living room furniture includes bedside tables, dining and occasional tables, sideboards and more! Click on the image or link above to view the Henley and Camden ranges. The HI-TECH CHROME is a boutique collection of URBAN style contemporary gloss finish metal bedrom, dining and licing room furniture. Pieces include a contemporary tall glass display cabinet, a spectacular circular display unit, dining tables, a sideboard, bedside tables, coffee tables and lots of other occasional tables, bar furniture bookcases, home entertainment furniture and more. FREE delivery! Click on the image or link above to view the HI-TECH CHROME range. The Japanese Minimalist mid 20th century is a collection of retro style black / oak veneer bedroom, living and dining room pieces. Think simplicity and function married with Japanese traditional Zen philosophy. The Urban Japanese Minimalist furniture collection includes occasional tables, cabinets, sideboards and more! FREE delivery! Click on the image or link above to view the Japanese Minimalist range. The Kentish oak furniture range is a contemporary range of bedroom, living room and dining furniture with louvred shutter effect doors and drawer fronts, chamfered edge details on drawers, dovetailed joints and round metal knobs. The range includes occasional tables, a bedside cabinet, a dressing table, a chest of drawers, a cabinet and a sideboard. FREE delivery! Click on the link or on the image above to view the Kentish contemporary oak furniture collection. An exceptional collection of Luxe contemporary glass finished / mirrored furniture. The Milan range includes plain glass furniture, patterned glass furniture, etched glass furniture, plain mirrored furniture, smoked mirrored furniture and more! Click on the image or the link above to view the Milan range. The Perspex clear acrylic contemporary furniture collection is a bang on trend collection of ultra modern living room and dining furniture and accessories. Most pieces are all clear acrylic (perspex) others have a splash of colour with some having a glass top, wooden shelves or grey or oyster fabric. Choose from over 30 Perspex acrylic pieces. Over 20 pieces of Shard ultra modern white high gloss contemporary furniture plus a few black sheep! The Shard white high gloss range includes lots of living room pieces including occasional tables, shelving units, dining furniture, a few bedroom pieces and some accessories. Click on the image or link above to view the Shard high gloss furniture range. The Waldorf Squares furniture collection is a contemporary twist on a retro modernist style, with its washed oak finish and accents of brass inlay and brass handles, it makes for an elegant smaller range, perfect for city apartments. The collection includes a stunning cocktail bar cabinet with cobalt blue velvet interior backing, entertainments units, a sideboard, a dining table, a large multi-shelf gold unit, occasional tables and a mirror. FREE delivery! Click on the image or the link above to view the Waldorf Squares furniture range. An eclectic selection of Urban Luxe contemporary accessories including contemporary wall art, large contemporary gold leopards, stags heads, buddhas, indoor planters, lots of different globes for the armchair traveller, wine racks and wine buckets. The collection also includes contemporary, wall clocks, a saxophone on a stand, a large silver shark and more. FREE delivery! Click on the image or the link above to view the contemporary accessories collection. The very best 2019 contemporary armchairs including fabric, leather and metal armchairs in a variety of colours and designs. The range covers fabric armchairs including cotton, linen, flannel and velvet armchairs plus leather and leather / stainless steel armchairs. Click on the image or the link above to view the contemporary armchair range. The very best contemporary occasional tables including console, end and side tables and desks. The range has over 100 different contemporary tables made from wood / steel, pine / chrome, slatted metal, chrome, chrome / glass, aluminium / glass, steel / glass, metal / leather, slate / metal and more in lots more different modern funky designs. FREE delivery! Click on the image or the link above to view the contemporary occasional tables range. As the range is so large the rest are available here including including gold, copper, glass, brass, black, weathered oak, faux ostrich and lots more types of coffee, console, end, side, tray, trestle and bar tables, desks and drinks trolleys for you to choose from to complete your interior design scheme. Click on the image or the link above to view the rest of the contemporary occasional tables range. The very best contemporary dining furniture collection including dining tables, chairs and bar stools. We have contemporary dining tables for 1 to 12 diners including chrome / glass, steel / glass, wooden, metal, industrial style, white high gloss and black dining tables plus a metal Bistro set. We also have lots of dining chairs in many modern designs, fabrics and colours. FREE delivery! Click on the image or the link above to view the contemporary dining furniture range. More of the very best contemporary dining furniture collection including dining tables, bistro tables, dining chairs and bar stools. Choose from a variety of contemporary styles including marble / stainless tables, modern wooden dining furniture, industrial style dining furniture, concrete dining tables, wooden dining tables with metal tops and vice versa and lots more. FREE delivery! Click on the image or link above to view the contemporary dining furniture range. All our drinks trolleys can be found here in one handy place for you including HI-TECH CHROME glass / steel drinks trolley, a round 3 tier HI-TECH CHROME steel drinks trolley, a mirrored drinks trolley, a gilt mirrored drinks stand, more drinks trolleys, bars and lots of bar tables and bar stools. Now who fancies a G&T? FREE delivery! Click on the image or the link above to view the contemporary trolley range. Here are our favourite contemporary easy chairs including occasional, tub, round back, Art Deco and retro easy chairs and stools in a variety of colours and designs. The range covers contemporary fabric easy chairs including cotton, felt, linen, satin, tweed and velvet easy chairs. We also have leather easy chairs and a stainless steel and cowhide chair. FREE delivery! Click on the image or the link above to view the contemporary easy chair range. 100s of diffferent exclusively designed contemporary table lamps plus LOTS of contemporary chandeliers, desk lamps, floor standing lamps, ceiling lights and wall lamps for you to choose from to give you the latest lighting vibe to complete any interior design scheme. Click on the image or the link above to view our huge lighting range. The latest rugs and floor coverings including plain and patterned rugs hand picked for you us. The range includes a selection of contemporary rugs including natural hide rugs, 2 spectacular Matador cow hide rugs and a hand stitched crewel rug plus also classic patterned rugs. Contemporary 2, 3 and 4 seater sofas and chaise longues. The range covers contemporary cotton, linen, flannel, satin and velvet fabric sofas. We also have buttoned leather sofas, leather Chesterfields, distressed leather sofas, a white leather sofa and more. Click on the image or the link above to view the contemporary sofa range. The trunks and trunk style furniture range includes contemporary leather, black, steel, brass, copper, stainless steel, check, tweed and copper clad trunks, travel chests, trunk style coffee tables, end tables, storage boxes, footstools and bedside tables and more! Click on the image or the link above to view the contemporary trunk and trunk style furniture range. Choose from our contemporary wall clocks collection all with FREE delivery! The range includes round, square, rectangular, hexagonal, watch face, and pocket watch style wall clocks and irregular shaped contemporary wall clocks, station wall clocks, a steering wheel clock, an Art Deco clock, retro clocks plus contemporary nickel, aluminium, wrought iron, distressed metal clocks and more! Click on the image or the link above to view our contemporary wall clocks range.